Affirm's Mobile App Puts Consumers In Control | PYMNTS.comWhat are credit cards all about? If you said, "Payments - duh," you're only half right. The whole point of buying things on credit, is to give individuals more control over their household cash flow by allowing them to buy the things they need and want to buy over time. 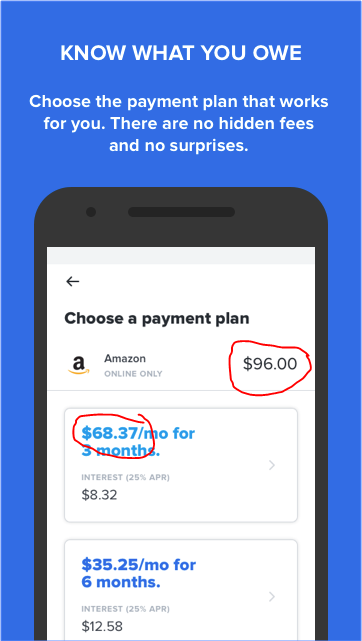 Affirm launches app to break purchases into monthly paymentsAffirm is rolling out an app to make it easier to pay for large purchases in monthly payments. The concept has been in beta testing and it is now being made available widely. The company was started by PayPal co-founder Max Levchin. He believes that his business promotes better fiscal responsibility than traditional credit cards. Affirm Reinvents Credit for 21st CenturyLAS VEGAS--()--MONEY 20/20 -- Affirm, Inc., the company started by serial entrepreneur Max Levchin to provide fair and honest financial services, today announced the public release of its new mobile application designed to reinvent personal credit. Affirm's new mobile app lets you borrow money for almost any online purchaseLending startup Affirm, founded by PayPal and Yelp co-founder Max Levchin, is out to destroy the credit card, or at the very least make a noticeable dent in its utter ubiquity. Wish it was accepted in more places! I have been using Affirm for large purchases $500+ from tech/e-commerce companies like Leesa (mattress), Casper (mattress) and Peloton (indoor cycling bike) with no interest and it's been awesome! Rebecca Garcia has used this product for one year. I used this to buy a computer from System 76. They have been really easy to work with. I setup auto pay to my debit card, they always send a warning and they payment just comes out. No worries. Love it. Will use again. Bart Lewis Jr. has used this product for one month. In 2016, credit card issuers in the United States raked in $94.3 billion in fees and $70.4 billion in interest income. The average credit card has 6 fees, with some having as many as 12! Credit is broken and the incentives for banks that issue it are built on business models that profit from hurting consumers and betting on their failure. The future of credit is here and it is not a piece of plastic, it is an app. The Affirm app will serve as a platform for us to deliver even more products that improves lives. Does this product work only for US citizens and permanent residents? @mlevchin yes, but I meant if it's restricted to citizens or any USA resident with a SSN can apply? @tonybrix yes this was just bad math in the screen shot :( updated now! Tried to submit my info via the "business" page, and got a "method not supported" error. Looks like form submission is currently broken? Hey @taylor_banks - I've been trying to duplicate that issue with no luck. Can you try filling out that form one more time to rule out a temporary provider hiccup? If it's still not working for you, can you shoot me a note at asi.behar@affirm.com to troubleshoot? @affirm @asibehar1 same error... sent email.